In the argument of which CCA reigns supreme, one CCA is bound to leave all the others floored. After all, members of Raffles Debaters find relish in “the simple challenge and thrill of standing up and telling someone that they’re wrong”. Many debaters cite their wish to build confidence and improve critical thinking skills as a key reason for joining the CCA. Some also candidly say that debating global and moral issues every week would guarantee a better GP grade. Granted, with two highly qualified coaches, like-minded peers and endless possibilities of debate-able motions, one gradually develops a strong grasp of politics, economics, and a smattering of general knowledge to boot. However, Raffles Debaters Chairperson Amanda Choo feels that “debate imparts skills that go much further in life” — for example, the ability to construct and assess arguments, listen effectively to others and respond intelligently. Perhaps more importantly, debaters learn a passion for humanity — indeed, two of alumni Adil Hakeem and Mitchell Tan’s first lessons for the Year 5 debaters was a simple mantra of “Be Angry”. Debate motions do not remain as passive essay questions to be stoically discussed, but involve human issues and sometimes human lives. On the floor, faced with blood-thirsty opponents (honestly! ), armed with only a small stack of cue cards (which sometimes contain only your team mate’s anguished scrawls) — debate requires both the team to brave the battle together and the individual to face the eight-minute speech alone. Chua Jun Yan, explains: “It all comes down to that performative streak inside you — the thirst for a fight, the hunger for the win”. Such hunger and perseverance is necessary, for the debate calendar is often packed with both national and open tournaments from March to December. Highlights include the MOE-ACJC Intercollegiate Debating Championships (the equivalent of the National Inter-School Championships for Debate), and the Heart of Europe Debating Tournament, an international debate tournament in the Czech Republic. Raffles Debaters emerged Grand Champions last year in both these competitions, a feat that Raffles Debaters hopes to perform once again. 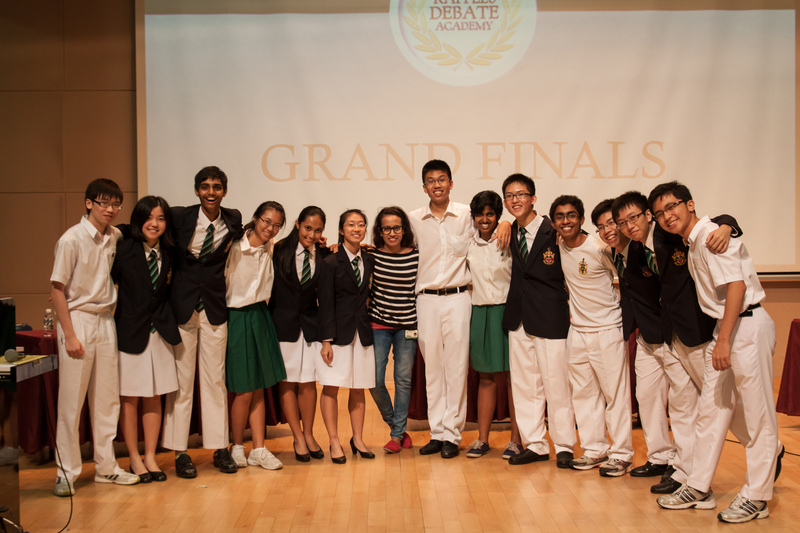 Beyond participating in competitions, Raffles Debaters flies the school colours by actively contributing to the local debate scene as well. Organised by Raffles Debate, the Raffles Debate Academy Under-14s Debate Championships has become a rite-of-passage for young debaters with its strong adjudication core and high quality of debating. Additionally, the biennial Prometheus Cup is a highly anticipated international tournament organised by the Raffles Debate Academy. Incoming debaters can look forward to hosting debaters around the world in November 2013. The club holds training sessions twice a week on Tuesday evenings and Saturday mornings. Usually, the session begins with the release of the motion, which can range from “This house would impose 100% inheritance tax on all estates” to “This house believes that ex-es should not remain friends”. The teams then settle down to prepare their cases. One hour later, the debate begins! The session is concluded with the coaches’ debrief. Putting their arguments aside, the relaxed and approachable club members will usually head for group lunch after the weekend sessions. Besides the training sessions, the club puts together birthday cards and celebrations for their club members (with the possibility of being caked!). Before the CCA break for the Year 5 Promotional Exams, the club held a fun “training” session with food, cake, sweets and even games like charades, where debaters discovered their skills at acting (or the lack thereof). Such acting would not be required for CCA trials though — prospective members only need to use their powers of persuasion to debate their way into the club! If you've thought that the Film Society was a club set up solely for watching films, think again. The Film Society was established for Rafflesians interested in films. As a CCA, it allows budding filmmakers to hone and display their skills in directing, writing, producing and editing short films.